As a first step, you will need to add the appropriate POS integration within your account. To do this hover over your profile picture > Company Settings > Add-ons > Third Party and click 'Add Integration'. Select TouchBistro from the list and click 'Add'. You can link your TouchBistro POS with 7shifts to provide accurate sales forecasting when building schedules. This allows for more accurate scheduling if you're wanting to stay on budget and within your labor target percentage. 7shifts will also show you in real-time what your actual sales are. Log in to your TouchBistro cloud portal with your account's username / password at cloud.touchbistro.com. Your restaurant ID will be displayed when you enable the feature. Now enable "Real-time Sales & Forecasting"
Enter your Restaurant ID (provided by TouchBistro) and click "Activate". Restaurant managers can ensure staff can only punch in if they're scheduled to work. Here's how it works: Staff will punch in on the TouchBistro POS. TouchBistro then sends the punch over to 7shifts to see if this Employee is scheduled to work and can punch in. If the Employee isn't scheduled to work in 7shifts, they will not be allowed to clock in. If they are scheduled work, they will be allowed to punch in. Hover over your profile picture > Company Settings > Add-ons > Third Party > TouchBistro. Now turn on 'Enforce Schedule' and click on select the grace period. This allows employees to clock in within that grace period based on their scheduled shift. Ex: If your employee is scheduled at 9am and your grace period is 10 minutes, the employee can clock in any time between 8:50am-9:10am. Once grace period is selected, click 'Save'. Please COPY your '7shifts API key' - you will need to enter it in subsequent steps. 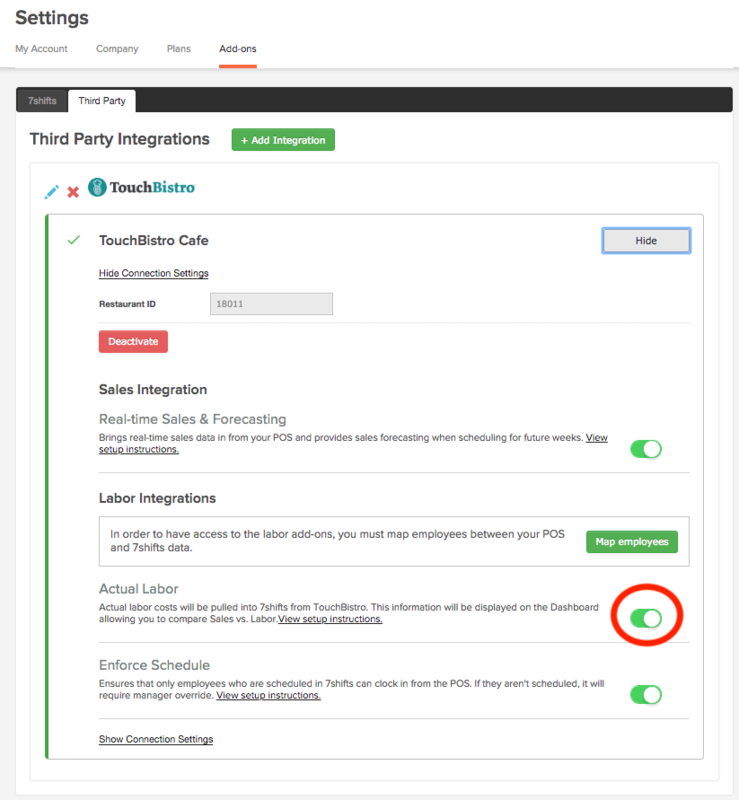 Now go into your settings in TouchBistro and click on 'Integrations'. Select 7shifts, which will appear under the 'Scheduling' list. Enable 7shifts to begin configuring it for TouchBistro.Using your API key that you have in your 7shifts account, enter it under 'API Key' and turn on 'Enforce Scheduling' as well as 'Enforce Role' if desired. Tap 'Done' at the top right when finished. 3. Ensure TouchBistro staff passcodes and 7shifts employee punch IDs are the same. From TouchBistro, visit Admin > Admin Settings > Staff. 4. Ensure TouchBistro staff types and 7shifts role names correspond. This is a necessary step to ensure that employee Roles are uniquely identified and mapped between 7shifts and TouchBistro. From TouchBistro, head to Admin > Admin Settings > Staff > Staff Types. Within each 'Staff Type', you'll need to scroll to the bottom and ensure that the 'Scheduling Integration Name' matches the specific Role name from 7shifts. *You must complete this field even if Staff Type and Role names are identical. You are now setup for Schedule Enforcement! Employees will only be able to clock into TouchBistro when they are scheduled to work a shift in 7shifts. We integrate with TouchBistro actual labor, this means your actual labor costs will be pulled into 7shifts. Once enabled, your actual labor costs will be displayed on the Dashboard allowing you to compare Sales vs. Labor. 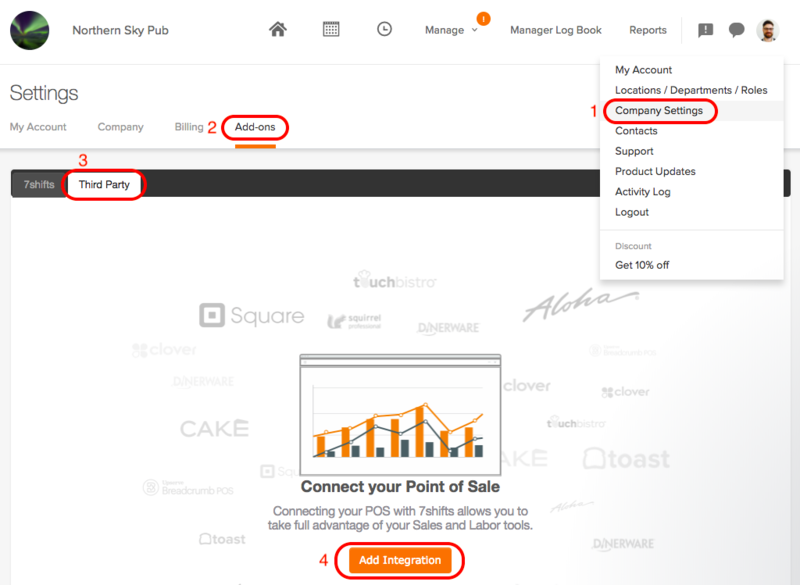 Hover over your profile picture > Company Settings > Add-ons > Third Party > 'TouchBistro POS'. Click 'Map Employees' to map your Employees between TouchBistro and 7shifts. Click the slider button to enable your Actual Labor at the bottom right corner of your screen. *Note: You'll see the Actual Labor numbers update on the Dashboard on the day you enabled TouchBistro Actual Labor. Going forward, these numbers will be updated daily from TouchBistro.